My fellow Girl Boss, Liz Lanuzo of Project Vanity, has finally turned her dream into reality and that is formalizing her blog as a business and turning it into a unique beauty resource that offers write- ups, workshops, videos, and now, beauty kits! Project Vanity has recently launched her Beauty Kits, which are like beauty boxes in concept, but offers something more different. Project Vanity Beauty Kits are curated to fit the beauty lifestyle of every modern Filipina. Now on her second kit, Project Vanity Girl Boss Kit features 7 beauty goodies that will get any go- getter Pinay primped and prettified in a jiffy. As a go- getter herself, Liz understands very well the importance of strategically owning certain beauty products that are pretty much foolproof, multitasking, and easy to use such as a powder blush (which can double as an eye shadow), lipstick (which can double as a blush), brow powder (which can double as an eye shadow too), mascara, eyeliner, and a pocketable base; there's a facial voucher as well because go- getter girls need some downtime too! You can order Project Vanity Beauty Kits over at Liz's website. Girl Bosses are subjected to stress most of the time, that's why she needs a great skin care regimen. Flawless Face and Body encourages every GB to take some time off and pay attention to their skin so she can conquer the world more confidently. Try Flawless' Nano Whiteness capsules, Pore Refiner Toner, and Oatmeal Soap, a skin care trio that helps your skin look radiant and healthy from the inside out; of course, visit Flawless weekly too for expert skin rejuvenation! Visit FLAWLESS FACE AND BODY on Facebook for more information about these products. For sure, traveling is a goal of many Girl Bosses (including me!) and Maybank acknowledges this dream of ours. 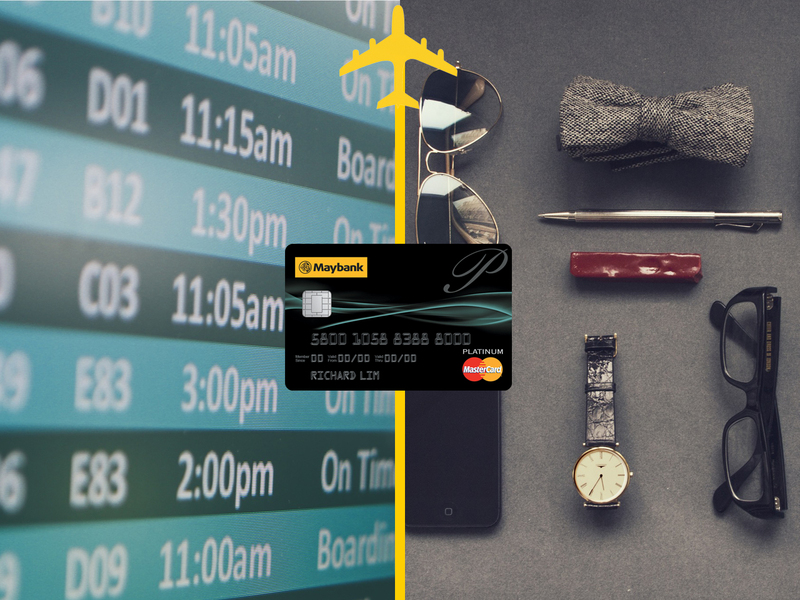 Maybank introduces the Maybank Platinum Card, a handy travel and shopping companion that offers a bunch of irresistible benefits; for every P50.00 purchase, spenders earn 1 Asia Mile or 1 KrisFlyer Mile, plus a 1% cash rebate if you use the card overseas. The credit card contains an EMV-compliant chip to help prevent fraudulent transactions and Maybank sends an SMS to the card holder after every transaction wherever they are in the world. As you acquire new experiences, things, and memories, Maybank rewards you for it so you can dream bigger and look forward to more exciting journeys ahead! Visit MAYBANK PHILIPPINES on Facebook for more information about this card. Too much goodies! I want to be part of Project Vanity's tooo. Hello Miss mArtha! Ive tried yung CC Cream ng Origins. So far so good, Origins' products are awesome! Wow! A lot of options for the girl bosses. I've been telling this but this is what is true. I am really fond of cute products and items in a pouch. I love to collect all my beauty items and have them store in colorful or super cute pouches or organizers. Plus this is really great, things to have to pamper yourself once in a while. I'm thrilled to see Project Vanity featured in this blog post! Both of your blogs have been my go-to reference for product reviews and recommendations for the past few years! I haven't tried any facial services from Flawless yet but a lot of my friends swear by them :) I was really excited when I found out that they started selling some of their skincare products in Watsons and some department stores too because not everyone has access to their clinics. :) I haven't tried anything from them at all, but when I run out of toner, I'm trying their Pore Refining one. Might try some of their soaps too! Awesome! I would like to try the Girl Boss kits! I'm so proud of Ms. Liz. I love reading yours and her blog both reliable source for great make up, skin care and DIY's. I wonder how much this beauty kit cost. it is a must have! I got the same kit as yours Ms. Martha :) Truly, skincare is a must to have a good skin for your makeup, it's easier kasi to apply makeup and less is needed when you have good skin :) I do have card on my own which is also so handy for me and been using it for 5 years already! I really like the idea of Ms.Liz and the Project Vanity team when it comes to handy make up kits. Really happy seeing bloggers support their friend blogger every time. .
Ive already tried the CC Cream from Origins and it really nice.